It was 2013, around 6 decades after independence. But some families still lived like refugees. His family was one of them, who had only enough to survive. Their lifestyle was simple and decent, unlike other people, who had now given up to show off! He was the fourth generation of his family now, since they shifted to India, after partition. His grandfather died 3 days ago, more than losing a grandfather, he was mourning over the fate of being poor. His grandfather had nothing to give them, no property, no money, nothing. He always dreamed of some long lost property papers, that his grandfather kept beneath his bed, but instead, he received an old, cranky, wooden box, as a possession. He didn’t know what awaited him inside that box, but he was curious to see it. He tried opening that box, but it was precisely locked. He picked up a hammer and broke the rusted lock. He lifted the wooden lid, slowly, and found another box, wrapped in old, yellowish newspaper. He removed the newspaper and took out the inner box, which had no lock. 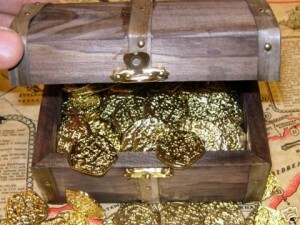 He just opened the lid, and was shocked to find out the box, full of golden coins. There was a letter with the box, which had an ancient language written over it. He turned the paper upside down, to find out, it was ‘English’. He read the message that his great-grandfather must have left inside. Few silent tears, stealthily found their way from his eyes to his cheeks, and his throat was choked. How could he be so shameless? He was reminded of the conversation, he had with his grandfather, 4 days ago. ‘God Bless You, son. Complete your studies, the world is all yours! Work hard, earn as much as you want’ his grandfather smiled weakly. ‘Oh yeah? Then why don’t you just die?’ he left the room angrily. His grandfather’s pain was visible through his eyes, but he didn’t say anything, after all he was still his little grandson. He gave him the box a day before his death. He cursed himself for being so self-centered and selfish. He wiped off his tears and ran to his father’s room, hugged him, and burst out crying. Neither his grandfather, nor his father used those coins, and lived their lives contently, then how could he waste that family possession for a bike or car? His father patted his back, smiled at him, and they both sealed those coins once again, in those wooden boxes, and kept them in his grandfather’s safe. Message*lovely story mehek.. loved it..